It has been a while since I posted to the blog. The reason being I had nothing much to say. So while I find something to say, there is always a lot of interesting stuff to read. While the message remains the same like all the basics of investing, it is not a bad time to reinforce some key fundamentals (given that the markets are at a high and everyone seems to think that will continue for a while!). So posting a really good read that I came across in the past few days. Joel Greenblatt is a very successful value investor and the founder of Gotham Capital, which offers four diversified long/short equity mutual funds. He has written several books on value investing identified in the notes below. 1. “One of the greatest stock market writers and thinkers, Benjamin Graham, put it this way. Imagine that you are partners in the ownership of a business with a crazy guy named Mr. Market. Mr. Market is subject to wild mood swings. Each day he offers to buy your share of the business or sell you his share of the business at a particular price. Mr. Market always leaves the decision completely to you, and every day you have three choices. You can sell your shares to Mr. Market at his stated price, you can buy Mr. Market’s shares at that same price, or you can do nothing. The more I read books on investing, the more I get convinced that investing is much simpler than most people think or are told. Simple, but not easy as Buffett had once said. Most of what one really needs to know is included in ‘The Intelligent Investor‘ by Ben Graham. I think everything else is either some adaptation, repetition or not very useful. ‘Winning the Loser’s Game’ by Charles D Ellis is another such book which is a good read on investment policy, and contains some timeless techniques repeated over and over again. The problem is not in understanding the lessons, it is in the implementing. 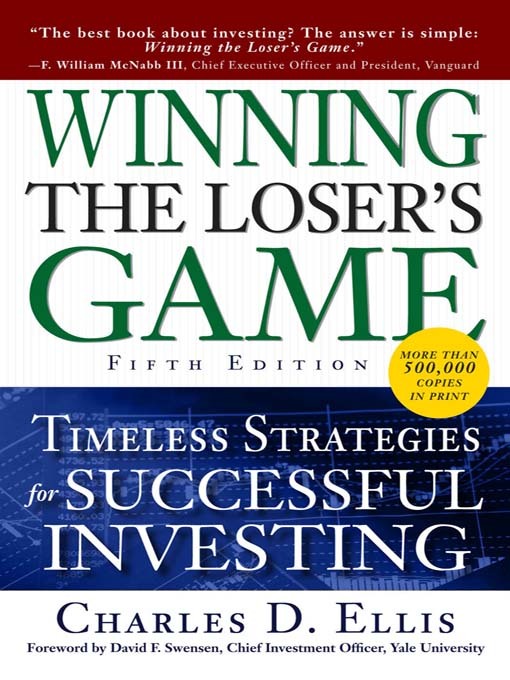 The underlying theme of the book is that due to the predominance of professional institutions in the markets in recent years, the very fact that each of them competes on the basis of trying to beat the market makes it impossible for any of them to consistently win – hence making it the loser’s game. For individual investors who are sidelined in this mad rush, reconciling to this fact and not trying to compete, but rather plodding along and trying to minimize mistakes, and refusing to play the game is the only real way they can win. And they can do that by adopting an investment policy with index funds, which provide them with an unfair advantage, at the core of it. But if that is the simple message of this book, why waste 200+ pages on it? Right at the outset, in the foreword, it is candidly stated that most of the message of such books can be completed in 2-3 pages of prose, (or as Scott Adams said in 1 page). That is the reason, if someone can provide the motivation and the conviction, it is still worth it. So at the cost of repetition, here are some of the key wonderful lines from this book ‘Winning the Loser’s Game’, which hopefully will serve that purpose. “You or no one else can ever beat the market consistently. If someone can, you can’t tell who it will be. So focus on your asset allocation, don’t lose to Mr Market’s moods, and use index funds, and you will beat most over the long-term – which is 20 years or more.” That’s about it. Over the past 6, 12 or perhaps 18 months, the Indian capital market performance has had a polarized structure. It is broadly divided into, on the one hand, a small set of wonderful companies that are grossly overvalued, whichever way you look at it, and which keep getting expensive; and on the other hand, a large set of decent or not so good businesses that are just about reasonably or grossly undervalued. Whatever the reason for it, but the fact is that mutual funds and fund managers who had performed quite well till about 2011 have suddenly lagged market indices, and in some cases, quite drastically. Value investors have found themselves wanting, in pursuit of value. May be it is a case of style drift, when a particular style of investing goes out of fashion and a new one catches on. May be it is something else. May be in the long-term they will catch up, may be they won’t – I don’t know. The fact is that as an individual layman investor, beating the market using star-ranked active funds or value style stock investing has not been easy. Moreover, beyond a new set of winners that have emerged, a large part of the mutual fund industry has found it difficult to match, forget beating, the main benchmark indices. So far till about couple of years back, in the Indian markets, it was not the case. But the usual winners are not winning, and that is the case if one looks at 6 month, 1 year, 2 year and in some cases, 3 year performances too. 3 years may not be sufficient time to assess performance, but the fact is there have been a new set of winners – in funds, fund managers and individual stocks. 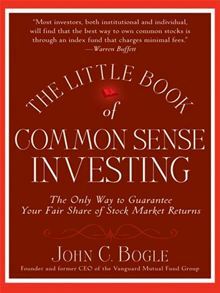 This triggered me to read ‘The Little Book of Common Sense Investing’ by John Bogle, the singular personality responsible for popularizing the Index Fund in the West through his mutual fund company Vanguard. Truly a masterpiece, this book makes it simple for the lay individual investor to incorporate the fundamentals of asset allocation and rebalancing into his portfolio based mostly on a set of low cost, Index funds. It is the easiest way a truly long-term investor can be assured of building wealth for himself over decades of investing. Bogle goes on demonstrate how investors turn a winner’s game into a loser’s game by chasing the illusion of market beating returns. He further explains that, while there will always be winners that beat the market over different periods of time, it is not predictable who will do so in the future based on past results, and shows how these winners change from time to time, thus surprising investors. Finally, he advocates that investors should focus largely on their asset allocation, rebalancing strategy and base most or all of their long-term portfolio on low cost index funds. And last but not the least, why it makes sense to base your really long-term portfolio on Index Funds, rather than on active funds or individual stocks. Most personal finance books are boring. Most of them have nothing new as such. Of course, there are the legendary books on investing that make great reading. They are generally written by gurus who have a past investing record, or by academics or a combination. Or they are written by journalists or writers following the lives of these ‘gurus’ and narrating them in an interesting manner. Such books are few and far between. Most others have a kind of sameness. 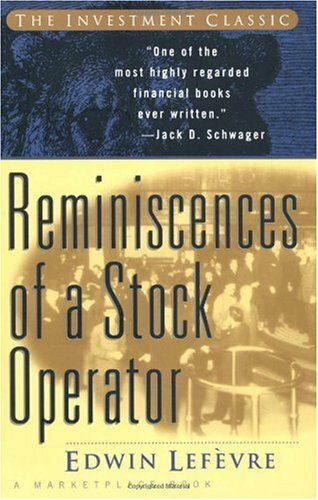 So when I read ‘The Reminiscences of a Stock Operator’ by Edwin Lefevre, I realised that I was reading a book on stocks that was a rare combination; a book with a fast-moving story, almost novel-type theatrics and some hard-hitting, long-lasting lessons. First published in around 1922, this is a book on the life of Lawrence Livingstone (fictional version of the real life speculator Jesse Livermore), and his stock speculation career. Starting as a gambler on stock prices, Livingstone develops a sense of timing for stock prices, and goes on to become one of the most celebrated stock traders on Wall Street in the early 1900’s; making and losing millions multiple times in the first three decades of the 20th century. He is a trader, an unabashed one, not an investor. But as he goes through his journey, he learns a lot of lessons, that may be applicable to investing as well. While I would not recommend this book for taking investing lessons, it is, nevertheless, the most entertaining book that I have read related to the stock markets. And through its pages of fast-moving, nerve-wracking stories and experiences on stock speculation, it contains a lot of wonderful quotes and takeaways for investors too. And there are many such super lines in this book almost in every chapter. Of course, a lot of the content is relevant to Wall Street in the early 1900’s, and lots has changed since then due to regulation and overall maturity of the capital markets. But despite that fact, this book is full of entertaining narrations of a full fledged stock operator who risked it all multiple times and learned many lessons on the way. While the book may not appeal to every one, till I read this book, I could never imagine that writing on stock speculation could be so entertaining, as well as so educative. A slightly old-ish book (first published in 1994), I chanced upon this book and picked it up again at the library recently, though I had read it a few years back. While after so many years, it may not seem to have anything new, given that there is so much written about Buffett since 1994 and there are so many books with ‘Buffett’ in the title because it sells; at the time it was first published, it was quite well received. A lot of the first half of the book is honestly quite disappointing, as it is essentially a repetition of what Buffett himself has already said in his letters to his shareholders over the years. The author himself is said to have confessed later though, that the book was actually meant to be marketing material for a hedge fund based on Buffett’s investment principles which he planned to launch later. 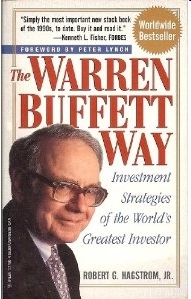 Nevertheless, setting that apart, the book contains quite a detailed analysis of the business, financial and market metrics of many of Buffett’s principal investments through his early partnerships and via Berkshire till then; as well as a detailed description of the circumstances under which some of these investments were actually made. Definitely till it was published, and perhaps even later, no other book seems to have done such an in-depth analysis so far of Buffett’s investments individually. This includes not only major holdings like GEICO, Washington Post, Capital Cities and Coke, but also other equity holdings like Gillette, Wells Fargo, Freddie Mac, as well as significant fixed income or bond investments that Buffett made till 1994. That part alone makes it decent learning for anyone interested in trying to emulate them. But the last chapter of this book titled ‘ An Unreasonable Man’ makes good reading for anyone interested in a summary of what constitutes the Warren Buffett way – even after 19 years. – Is the business simple and understandable? – Does the business have a consistent operating history? – Does the business have favorable long-term prospects? – Is management candid with its shareholders? – Does the management resist the institutional imperative? – What is the value of the business? – Can the business be purchased at a significant discount to its value? It seems like an oft-repeated but decent set of common factors if one were to evaluate Buffett’s purchases over the years. Though of course, a lot of these can be said to be qualitative and imprecise beyond a certain point, and seem to have changed a bit in recent years. Of course, it is not necessary (in fact, not even recommended) for every investor to imbibe these in their investing approach as such – that will only make investing complex for normal individual investors. It is not required for most investors to even attempt it. But for those who have formulated their investing approach, and are interested in studying Buffett’s methods, though the book title promises more, The Warren Buffett Way does have a decent analysis of past investments and a checklist for the enterprising investor. 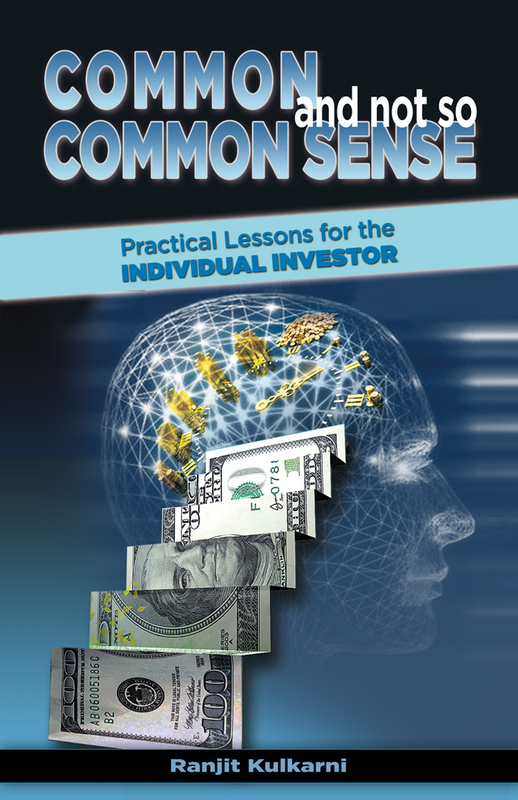 I have compiled some of my writings over the past couple of years into a book titled ‘Common and Not So Common Sense: Practical Lessons for the Individual Investor’. Please let me know if the above links do not work, and I can order a copy for you if required. As always, I am reachable at ranjitrrk@yahoo.co.uk or through comments below. Feedback is more than welcome! Please feel free to share this post or the links above, and spread the message to your friends and contacts who may be interested. For further updates or future posts, you may follow the blog by subscribing via email in the box in the right column. One Idiot is a short 30-minute movie with a message on financial independence. The film is an initiative from IDFC Foundation (which may mean that it may indirectly and tacitly act as marketing for their mutual fund). But nevertheless despite that, it is a nice attempt to educate the youth of today’s urban India on the importance of taking control of their financial lives (in the world of plenty that they are today exposed to), and how it can pay rich dividends over time and also make them ‘cool’. It depicts an ‘idiot’ uncle whose dressing, chappals and haggling on vegetables makes him the laughing stock of teenagers, while they indulge in ‘cool’ activities, and often find themselves or their parents short on money. Their attitude changes when they realise that he is actually a multi-millionaire who has made his money work. The film ends with important financial messages communicated in a simple manner by the ‘idiot’ to the youth. The film has been screened at a number of colleges in India since December 2012 and will hopefully add to the level of financial education, something that is not taught at our educational institutes. Directed by Amol Gupte, One Idiot is a pleasant attempt to educate young people in a non-intrusive, entertaining manner on the power of saving, investing and compounding, and the effect it can have on your financial independence over long periods of time. Some creative hyperbole is used for effect (e.g. Net Worth of 100 cr, Rolls Royce, presumably for shock value – one may also call it false promises). The film’s creative aspects and story telling are good, and overall, it effectively conveys the value of investing and compounding, specially if one starts early in a manner that makes it ‘cool’ for college goers.